I made 2 - 9"x 13" spice cakes. I used Betty Crocker boxed cake mixes and baked according to package directions. I let them cool completely. Then I drew a pattern on paper to look like a grand piano. I cut both cakes the same. I iced between the layers with buttercream icing, then stacked the 2 layers. 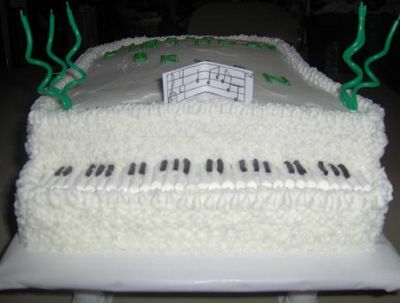 I put a base of buttercream on, it was hard because the cake kept crumbling, so I left the top of the piano smooth and used a star tip and went around the sides and covered it completely. Then I used a small round tip and colored some icing green and wrote Happy Birthday Bryan on top. I stuck 6 spiral green candles to represent candelabras, 3 on each side of the piano. 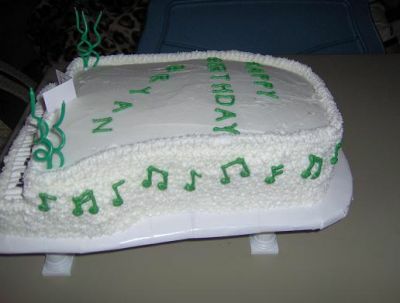 I used the same tip and green icing to make music notes all around the side of the cake as well. I used candy cigarettes for the white notes and black licorice for the black notes. I broke the candy to fit and cut the licorice. I also used a small piece of card stock and drew music and folded down the middle and stuck on top of the piano.